Our members are working to transition 1,500 people experiencing homelessness into stable housing. One way our members do this is through Coordinated Entry For All (CEA). 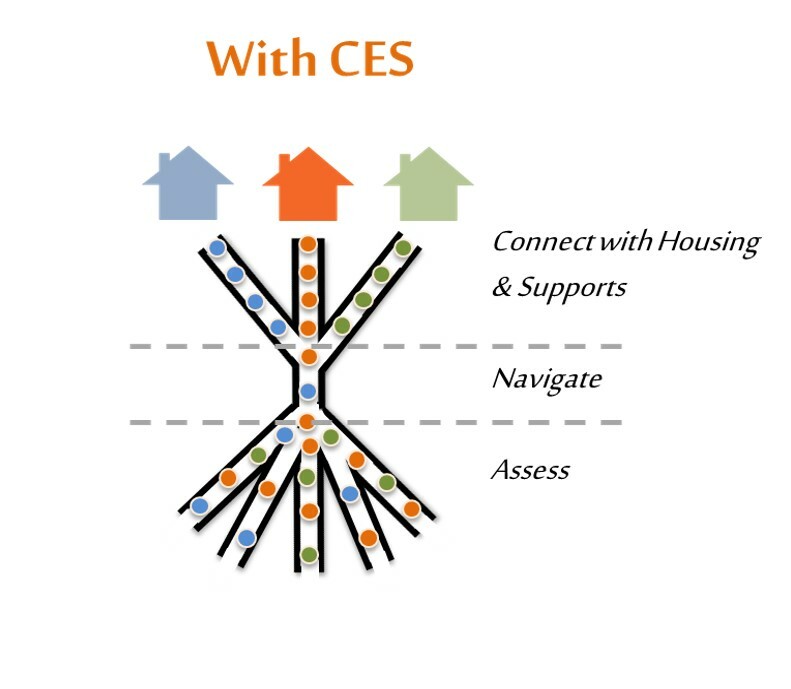 CEA is a standardized assessment tool to match people to housing resources. This system ensures that all people experiencing a housing crisis have fair and equal access to housing based on family’s vulnerability of needs. The coordinated entry processes helps communities prioritize assistance based on vulnerability and severity of service needs to ensure that people who need assistance the most can receive it in a timely manner. Hours of Operation: Monday – Friday 9:00 a.m. – 5:00 p.m. Evenings and weekend hours by appointment only. Walk-In Hours: Thursdays 9:00 a.m. – 12:00 p.m.
To schedule an appointment for an assessment at this site, call 211. Please note: Due to demand it’s possible that not all households that seek a walk-in assessment will be able to be accommodated at the time of walk-in. Hours of Operation: Monday – Friday 9:00 a.m. – 5:00 p.m. Evenings and weekends by appointment only. Hours of Operation: Monday – Friday 9:00 p.m. – 5:00 p.m. Saturday hours by appointment only. Walk-In Hours: Mondays and Wednesdays 1:00 p.m. – 3:00 p.m.
To schedule an appointment for an assessment at this site, call 211.. Hours of Operation: Monday – Friday 9:00 a.m. – 5:00 p.m.
Walk-In Hours: Saturdays 10:00 a.m. – 1:00 p.m.
Walk-In Hours: Thursdays 2:00 p.m. – 7:00 p.m. Hours of Operation: Monday, 9:00 a.m. – 7:00 p.m.; Tuesday, Wednesday, Thursday: 8:30 a.m. – 6:00 p.m.
Walk-In Hours: Tuesdays 9:00 a.m. – 3:00 p.m.
Walk-In Hours: Mondays, 1:00 p.m. – 3:00 p.m.